F?our drinking buddies with a dark secret reunite after ten years ?for a bachelor party on the Bluegrass Bourbon Trail in 1977 rural Kentucky. But when the friends discover that their favorite distillery has been turned into a winery, the newly sober groom, Gordie, seizes on an even better adventure search for the legendary ?buried Prohibition money? deep within the woods of Bullitt County, KY?. The others reluctantly join him on his quest, only to? 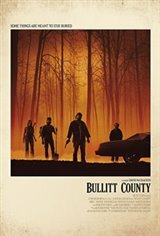 discover there's something much more dangerous in Bullitt County than cursed treasure. The friends may have forgotten the dark secret from their past, but the past hasn't forgotten them.